Camp Odayin’s Winter Camp is for children who attended Residential Camp or Day Camp during the previous summer. Parents/guardians will receive Winter Camp 2020 registration information via email in December. The registration deadline is January 31st. 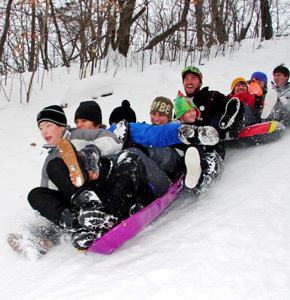 Winter Camp is hosted at Camp Wapogasset in Amery, WI, one hour and twenty minutes from the Twin Cities and free round trip transportation is provided from Minneapolis and Madison. The only charge to attend camp is $25. Registrations are processed during December & January. In February, you will receive the themed packing list, authorization forms and additional details. Please contact us at info@campodayin.org if you are unable to do an online registration. Thanks to a generous donor, we are able to offer transportation support. Up to $300 can be reimbursed for your travel costs. Contact the Camp Odayin office at matt@campodayin.org to learn how to be reimbursed for your travel costs. We are also able to cover your child’s cost to attend camp if you are unable. You decide the level of payment you are comfortable with during the registration process.